The rise of smartphone usage has changed communication patterns and paralleled an increase in individuals reporting feeling lonely and disconnected, especially among young adults. As a result, crisis helplines are expanding their text services to keep pace with new communication trends during a time of growing need. However, tools for training helpline counselors provide insufficient practice and remain time consuming. I am working in partnership with a crisis helpline to build a dialog system that can be used to train crisis helpline counselors on how to intervene and de-escalate crises. This tool is designed as an interactive, automated tutoring agent that will simulate a person in crisis over text and allow counselors to practice intervening while receiving feedback on the particular approaches they choose to take. I will discuss the unique opportunities and structure within the problem setting and my work on the various associated challenges. Challenges include collecting appropriate data, developing a meaningful baseline system, comparing response selection with generation, and designing approaches to evaluate input quality and guide users towards improvement. Many of these challenges are frequently encountered with language systems, so I will discuss how the domain poses a novel opportunity to mitigate some of them. Such a system could help novice counselors learn, practice, and build confidence with crisis intervention strategies in a low pressure environment that puts no individual in danger. As a result, such a system will hopefully help crisis centers meet the rising demand for their services. 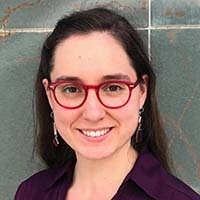 Orianna is a PhD candidate in Computer Science at the University of California Berkeley and a Data Science Fellow at the Berkeley Institute of Data Science. Her work focuses on applications of machine learning to improve mental health wellbeing and care delivery. Her work experience includes Lawrence Berkeley National Lab and Twitter. Previously she held an ARCS Fellowship and received a bachelor’s degree at McGill University. Her work has won awards through the Big Ideas competition CITRIS Mobile App Challenge and CITRIS Tech for Social Good program. She has worked to make STEM more accessible by mentoring 12 undergraduate research projects serving as co-president of Women in Computer Science and Electrical Engineering at Berkeley and working as a teaching assistant for the Fung Fellowship for Wellness and Innovation which focuses on designing tech solutions to address public health challenges.